Volotea, the airline of mid and small-sized European cities, has reached its 20 million passenger carried since its operations started in 2012. Volotea has reached its 20 million passengers carried since 2012. The passenger, Laurent Lannou, was flying from Bordeaux to Majorca and was awarded with a year-long free flights prize to any destination from Bordeaux. The airline reaches this mark after carrying more than three and a half million passengers between last June and September, with an average 95% load factor. Volotea has carried 20 million passengers and will operate more than 44,000 flights this year. The airline has more than 30 aircraft on its fleet and operates a total of 293 routes in 2018 connecting 78 European cities in 13 countries, including: France, Italy, Spain, Germany, Greece, Croatia, the Czech Republic, Albania, Portugal, Malta, Austria, Ireland and Luxembourg. Volotea grows profitably since 2014 and has employed more than 1,000 people this year. Volotea has carried 20 million passengers since its first flight in 2012 and more than 4.8 million in 2017. In 2018, Volotea has opened 58 new routes to serve a lineup of 293 routes, operating flights to 78 mid and small-sized European cities in 13 countries: France, Italy, Spain, Germany, Greece, Croatia, the Czech Republic, Albania, Portugal, Malta, Austria, Ireland and Luxembourg. The airline expects to carry between 5.7m and 6.0 passengers at the end of 2018. Volotea has currently twelve bases: Venice, Nantes, Bordeaux, Palermo, Strasbourg, Asturias, Verona, Toulouse, Genoa, Bilbao, Marseille and Athens. These last three have been inaugurated recently in 2018. 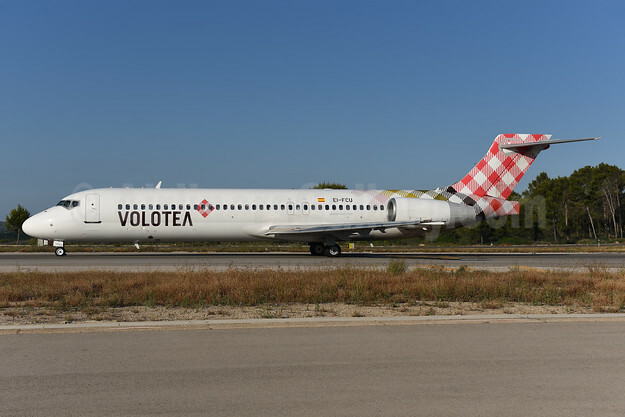 Volotea will inaugurate a new base in Cagliari. Volotea employs over 1,000 people in summer 2018, a year in which it added 250 new positions. In 2018, Volotea operates its network with 32 aircraft, Boeing 717s and Airbus A319s. Both models are recognized for their comfort and reliability, with Volotea offering reclining seats which are 5% wider than the average in airlines. The Airbus A319 is the aircraft model selected for its future growth and will allow the company to increase its passenger capacity by 20% to 150 seats and to serve longer routes. Top Copyright Photo (all others by Volotea): Volotea Boeing 717-2BL EI-FCU (msn 55190) PMI (Ton Jochems). Image: 943837. This entry was posted in Volotea and tagged Boeing 717-2BL, EI-FCU, msn 55190, Volotea on October 13, 2018 by Bruce Drum.